Children are invited to pick up an entry form from Waitrose on Saturday between 9am and 1pm. 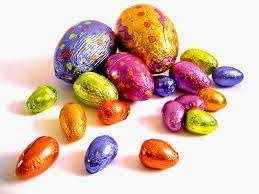 This form has 10 spaces for the names of any 10 of the shops displaying one of these Easter Egg Pictures. All the children need to do is find 10 of them and fill in the names of those 10 shops where they found them (just make sure you bring a pen or pencil to fill in the form). When they return the completed form to Waitrose they will receive a special Easter Treat. This is all being organised by Worcester Park's traders with the prizes being donated by Waitrose so there is no cost involved. However there is a limited (albeit large) number of entry forms (and prizes) so get in early!